If you are looking for a meal to impress, this is it. 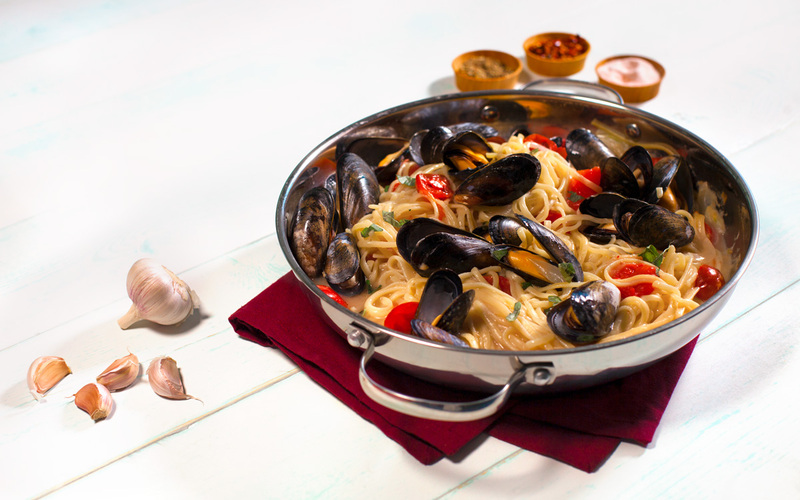 One-pot mussel pasta looks and tastes like it’s from a 5-star restaurant, but is easily made at home. Brian from Seafood City will wrap up those tasty mussels. Make sure to add some freshly grated parmesan and garnish with basil to complete this dish to perfection. Combine pasta, tomatoes, onion, garlic, red-pepper flakes, basil, oil, a good pinch of salt and pepper, water, and wine in a large straight-sided skillet. Bring to a boil over high heat. Boil mixture, stirring and turning pasta frequently with tongs, until pasta is just al dente and water has mostly evaporated, about 7 minutes. Add mussels, cover skillet with a lid and let mussels steam until opened, about 2 minutes. Discard any mussels that have not opened. Season to taste with additional salt and pepper, divide among serving bowls, and garnish with basil and Parmesan cheese.